Walsh University now offers on-campus housing options for students pursing Graduate studies. 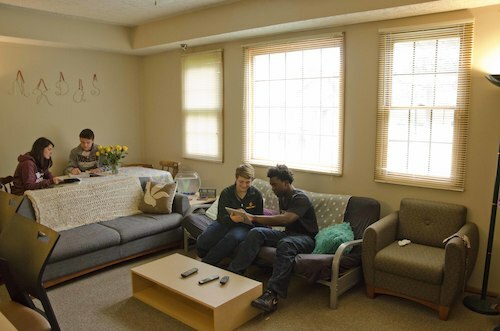 Living on campus makes life much easier in a safe and comfortable environment. 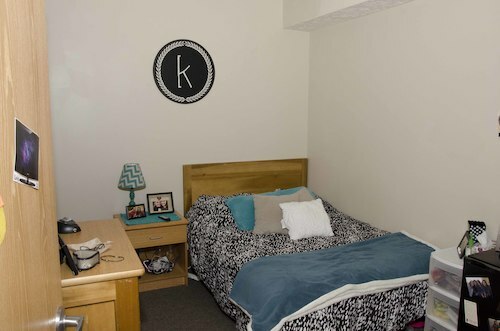 Our on-campus apartments are fully outfitted and provide easy access to our academic facilities and campus services. Our University Apartments (Brauchler, Meier, and Stein Halls) provide quad-style living with single-bed rooms (two shared bathrooms), fully outfitted kitchens, and a private laundry room. The apartments are fully furnished and all extra charges for utilities (electric, heat, water, cable, and internet) are included as part of your housing contract. Other on-campus housing accommodations may be available upon request. More information about our University apartments is available here. The student must be enrolled for 9 credit hours in a Walsh University Graduate Program. Complete housing rate information is available here. Graduate students may choose a Full or Limited University Meal Plan. A breakdown of meal plan options and prices is available here. Graduate housing availability is often limited. For more information, please contact Tiffany Kinnard-Payton at (330) 490-7538 or tkpayton@walsh.edu. *At this time, we do not offer housing options for graduate students who are married and/or with families.